digital history project: Joseph Balsamo, Count de Cagliostro – Necromancer, Hypnotist, and Charlatan. Joseph Balsamo, Count de Cagliostro – Necromancer, Hypnotist, and Charlatan. In the summer of 1893, a conjurer calling himself "Cagliostro" was astonishing Paris with his feats of fin­de-siecle magic. Being a student of occultism generally, but more particularly of natural magic and legerdemain, I went to see the nineteenth-century necromancer exhibit his marvels. I saw clever illusions performed dur­ing the even­ing, but noth­ing that excited my especial in­terest as a devo­tee of the weird and wonderful, until the presti­digitator came to his piece de resistance—the Mask of Bal­samo. That aroused my flagging atten­tion. The fan­taisiste brought forward a small table, undraped, which he placed in the center aisle of the the­ater; and then passed around for examination the mask of a man, very much resembling a death-mask, but unlike that ghastly memento mori in the particulars that it was exquisitely masqueraded under modeled in wax and artistically colored. "Messieurs et mesdames," said the professor of magic and mystery, "this mask is a perfect likeness of Joseph Balsamo, Count de Cagliostro, the famous sorcerer of the eighteenth century. It is a reproduction of a death-mask which is contained in the secret museum of the Vatican at Rome. Behold! I lay the mask upon this table in your midst. Ask any question you will of Balsamo, and he will respond." The mask rocked to and fro with weird effect at the bidding of the conjurer, rapping out frequent answers to queries put by the spectators. It was an ingenious electrical trick. Being already acquainted with the secret of the surpris­ing experiment in natural magic, I evinced no emotion at the extraordi­nary behavior of the mask. But I was in­tensely interest­ed in the mask itself. Was it indeed a true likeness of the great Caglios­tro, the prince of charlatans; the famous nec­romancer of the old regime, who foretold the fall of the Bastile; the bosom friend of Cardinal de Rohan, and arch-master of Occult Freemasonry? I re­paired to the manager's office at the close of the "soiree magique," and sought an in-magician who had the cognomen of Cagliostro. "Is monsieur an aspiring amateur who wishes to take lessons in legerdemain from M. de Cagliostro?" "Pardon! Then monsieur is desirous of purchasing the secrets of some of the little jeux?" I replied, as before, in the negative. The manager shrugged his shoulders, toyed with his ponderous watch-chain, and elevated his eyebrows inquir­ingly. "I simply wish to ascertain whether the mask of Balsamo was really modeled from a genuine death-mask of the old-world wizard." "Monsieur, I can answer that ques­tion, "said the theatrical man, "without an appeal to the artist who performed this evening. 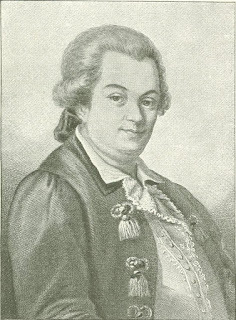 It was taken from a likeness of the eighteenth-century sorcerer, not a death-mask as stated, but a rare old engraving published in the year 1789. Unfortunately, this picture is not in our possession. How­ever, you may be able to pick up one in the antiquarian shops of the quai Vol­taire." I thanked the manager for his in­formation, and re­turned to my hotel. The story about the death-mask in the possession of the Vatican was simply a part of the presti­digitator's patter, but everything is per­missible in a conjur­ing seance. Cagliostro! Cagl­iostro! I was pur­sued all the next day, and for weeks afterward, with visions of the enchanter. "Ah, wretched mask of Balsamo," I said within myself, "why have you bewitched me thus with your false, oleaginous smile?" I took to haunting the book-stalls and anti­quarian shops of the quais, in the hope of picking up some rare prints of the arch-quack. My labors were not in vain. I was fortunate in discovering a quaint little volume, the life of Cagliostro, translated from the Italian work printed under the auspices of the Apostolic Chamber, Rome, 1790. It was entitled "Vie de Joseph Balsamo, Connu Sous le Nom de Comte Cagliostro, Traduite d'apres l'orig­inal italien, imprime a la Chambre Apos­tolique; enrichie de Notes curieuses, et ornec de son Portrait. Paris . . . et Strasbourg. . . . 1791. "The front­ispiece was an engraved portrait of Cagl­iostro. Yes, here was the great magician staring at me from out the musty, faded pages of a quaint old chronicle. A world of cunning lay re­vealed in the depths of his bold, gleam­ing eyes. His thick lips wore a smile of Luciferian subtlety. Here, indeed, was a study for Lavater. 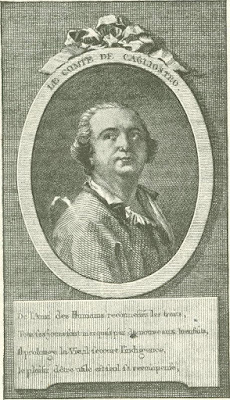 From an old Nor­man bouquiniste I bought a brochure, written in English, treating of the career of Cagliostro during the years 1786 and 1787, entitled : "Life of the Count Cagl­iostro, etc. Sold by T. Hookham. Bond Street, London, 1787." It, too, con­tained an engraving of Balsamo, with a view of the Bastile, wherein he lan­guished many weary months preceding the romantic trial of the "Diamond Necklace," a cause celebre known to all students of French history. I was unable to resurrect any other portraits of the charlatan during my sojourn in Paris, though I spent days searching for them in the dark little shops of the quai Voltaire. On my return to America, I visited the splendid library of the Army Medical Museum, at Washington, and came across a number of fine eighteenth-century engravings of the impostor, forming a part of a remarkable collection of portraits of famous physicians of the world. Caglios­tro, be it remembered, posed as a wonder doctor. He accomplished some remarkable cures which are well attested. He made use of hypnotism in his medical practice with great success, being conversant with Mesmer and his theories. Mesmer and Cagliostro, though charlatans, were ahead of their time in the recognition of hypnotism as a curative agent. The literature on the subject of Caglios­tro is not voluminous, consisting mostly of rare brochures in French and German, written by those who had personal acquaintance with him. The Inquisition bi­ography is fair­ly good. The arch-enchanter ap­peared on this mortal scene when the times were "out of joint." It was the latter part of that strange, romantic eight­eenth century of skepticism and credulity. The old world like a huge Cheshire cheese was being nib­bled away from within, until little but the rind was left to tell the tale. The rotten fab­ric of French society in par­ticular was about to tumble down in the sulphurous flames of the Revolution, and the very people who were to suffer most in the calamity were doing their best to assist in the process of social and political disinte­gration, seemingly careless of the impend­ing storm whose black clouds were slowly gathering. The more skeptical the age, the more credulity extant. Man begins by denying, and then doubts his doubts. Charles Kingsley says: "And so it befell, that this eighteenth century, which is usually held to be the most 'materialistic' of epochs, was, in fact, a most 'spiritual­istic' one." The soil was well fertilized for the coming of Cagliostro, the sower of superstition. Every variety of mysticism appealed to the imaginative mind. There were some of illuminati, Rosicrucians, alchemists.and Occult Free-masons. And now for a brief review of the career of the most remarkable charlatan the world has ever seen —a man who "deeply im­pressed himself on the history of his times. Princes and nobles thronged to his magic operations. They prostrated themselves be­fore him for hours. His horses and coaches and his liveries rivaled a king's in magnificence. He was offered and refused a ducal throne." Goethe and Catherine II wrote plays about him. Joseph Bal­samo, the son of Peter Bal­samo and Feli­cia Braconieri, both of mean extraction, was born at Palermo, on the 8th day of June, 1743. He received the rudiments of an education at the Seminary of St. Roche, Palermo. At the age of thirteen, according to the Inquisition biographer, he was entrusted to the care of the Father-General of the Benfratelli, who carried him to the convent of that order at Caltagirone. There he put on the habit of a novice, and, being placed under the tuition of the apothecary, he learned from him the first principles of chemistry and medicine. He proved incorrigible, and abandoned the convent for a dissipated life in Palermo. He was accused of forging theater-tickets and a will, and, finally, had to flee the city for having duped a man named Marano of sixty pieces of eight by promising to assist him in unearthing a buried treasure by magical means. Marano entered the cavern, and discovered, not a treasure, but a crowd of Balsamo's accomplices, who, disguised as infernal spirits, administered to him a terrible beating. Furious at the deception practiced upon him, the luckless goldsmith vowed to assassinate the pretended sorcerer, Balsamo, but that ingenious youth got safely to Messina, where he fell in with a strolling alchemist named Althotas, or Altotas, who spoke a variety of languages. They traveled to Alexandria in Egypt, and finally brought up at the island of Malta. There they remained for some time, working in the laboratory of the Grand Master of the Knights of Malta. Althotas having died, Balsamo went to Naples. After that he visited Rome, and married a beautiful girl of the people, Lorenza Feliciani. In com­pany with a swindler calling himself the Marchese d'Agliata, he had a series of disreputable adventures in Italy, Spain and Portugal. In 1776 he arrived in London, England. He had assumed various aliases during the course of his career, but now he called himself Count di Cagliostro, worker of wonders, especially in medicine. He carried about two mysterious substances — a red powder, known as his "Materia Prima," with which he transmuted baser metals into gold, and his "Egyptian Wine," with which he prolonged life. He foretold the lucky numbers in a lottery and got into a difficulty with a gang of swindlers, which caused him to flee from England to avoid being imprisoned. After wandering in various countries — Belgium, Holland, Germany and Russia — he came to Paris, and set up for a veritable en­chanter, and founder of the Occult order of Egyptian Freemasonry, the true form of which was supposed to have been com­municated by the Grand Cophta, or High Priest of the Egyptians, to Cagliostro. These degrees were conferred only upon master Masons, but Balsamo also instituted an order of female Masons, so as not to disappoint the ladies and deprive them of the higher branches of occult knowledge. Power over the spirit-world was promised to those who became adepts in Egyptian Masonry. It is difficult to say where Cagliostro was initiated into the degrees of Freemasonry. I have had some correspondence with Masonic scholars in England and on the Continent, but they have been able to shed no light on the subject. It is asserted that he received the degrees of the Blue Lodge in the month of April, 1776, in the Esperance Lodge, No. 369, held at the King's Head Tavern, London; but there is no actual evidence in support of this assertion. His first Egyptian lodge was opened at Stras­burg in 1779. In 1782 he inaugurated the lodge of "Triumphant Wisdom" (La Sagesse Triomphante) at Lyons, France, and in 1785 the famous lodge in Paris. Cagliostro is regarded as the greatest Masonic impostor "of the world. His pre­tensions were bitterly repudiated by the English members of the fraternity, and many of the Continental lodges. But the fact remains that he made thousands of dupes. Cagliostro declared that Moses, Elias and Christ were the Secret Superiors of the order. The meetings of the Egyptian cult were nothing more than spiritualistic seances, during which com­munications were held with the denizens elf the celestial spheres. "De l'Ami des Humains reconnaissez les traits : Tous ses jours sont marques par de nouveaux bienfaits, Il prolonge la Vie, it secourt l'indigence; Le plaisir d'être utile est seul sa recompense." There were neckties and hats a la Cagl­iostro. He gave away large sums to the poor and cured their ailments free of charge, much to the disgust of the legiti­mate practitioners. His house was always thronged with noble guests, who came to witness the strange seances. People went to sup with the shades of Voltaire, Rousseau, and other dead celebrities, ancient and modern — summoned from the "vasty deep" to amuse a frivolous aristocracy. How were these phantoms evoked? Concave mirrors, concealed con­federates, and images cast upon the smoke rising from burning incense, constitute the art of phantasmagoria. Arthur Edward Waite, author of various works on the history of magic and alchemy, while ac­knowledging the fact of Cagliostro's "transcendental trickery," seems to think the so-called magician was really possessed of occult gifts of some sort which assisted no little his unparalleled rogueries. He says: "Mystical knowledge beyond that of the age in which he lived was undoubtedly his, and though it was still superficial, he had a genius for making the most of it." Speaking of the charlatan's career in Paris, Waite says: "He assumed now the role of a practical magician, and aston­ished the city by the evocation of phan­toms, which he caused to appear, at the wish of the inquirer, either in a mirror or in a vase of clear water. These phantoms equally represented dead and living beings, and as occasionally collusion appears to have been well-nigh impossible, and as the theory of coincidence is preposterous, there is reason to suppose that he produced results which must sometimes have astonished himself. All Paris, at any rate, was set wondering at his enchantments and prodigies, and it is seriously stated that Louis XVI was so infatuated with "le divin Cagliostro, "that he declared anyone who injured him should be considered guilty of treason. At Versailles, and in the presence of several distinguished nobles, he is said to have caused the apparition in mirrors and vases, not merely of the specters of absent or deceased persons, but animated and moving beings of a phantasmal description, including many dead men and women selected by the astonished spectators." Perhaps the truth of the matter was that Cagliostro had stumbled upon some of the facts of hyp­notism and telepathy, which when exhib­ited with the proper mise-en-scene produced marvelous ef­fects akin to genuine magic. 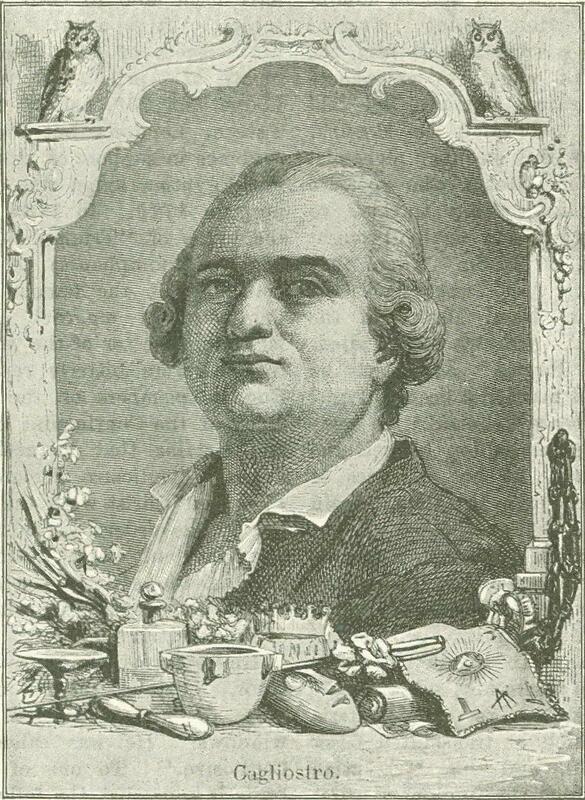 "Cagliostro was of medium height, rather stout, with an olive complexion, a very short neck, round face, two large eyes on a level with the cheeks, and a broad, turned-up nose. . . . His hair was dressed in a way new to France, being divided into several small tresses united behind the head, and were twisted up into what was then called a club. "He wore on that day an iron-gray coat of French make, with gold lace, a scarlet waistcoat trimmed with broad Spanish lace, red breeches, his sword looped to the skirt of his coat, and a laced hat with a white feather, the latter a decoration still required of mountebanks, tooth-drawers, and other medical practitioners who pro­claim and retail their drugs in the open air. Cagliostro set off this costume by lace ruffles, several valuable rings, and shoe-buckles which were, it is true, of antique design, but bright enough to be taken for real diamonds. . . . The face, attire, and the whole man made an impression on me that I could not prevent. I listened to the talk. He spoke some sort of medley, half French and half Italian, and made many quotations which might be Arabic, but which he did not trouble him­self to translate. I could not remember any more of his conversations than that the hero had spoken of heaven, of the stars, of the Great Secret, of Memphis, of the high-priest, of transcendental chemistry, of giants and monstrous beasts, of a city ten times as large as Paris, in the middle of Africa, where he had correspondents." On the 22d day of August, 1785, Cagl­iostro was arrested under a lettre-de-cachet, and cast into the Bastille, charged with complicity in the "Affaire du Collier, "as it is called in the musty archives of the French Parliament. Acquitted by the courts, he was banished from France by order of Louis XVI. He went to England, and there, on the 20th day of June, 1786, predicted the fall of the Bastille, declaring that it would be raised to the ground and converted into a public promenade. How this prophecy was fulfilled, history will testify. Cagliostro had a peculiar deal, upon which were engraved the mysterious letters "L. P. D." These letters are supposed to stand for the Latin sentence, "Lilia pedibus destrue," which translated signi­fies, "Tread the lilies underfoot" — alluding to the overthrow of the French monarchy. Many theosophical writers have placed implicit belief in the mission of Cagliostro as the secret emissary of an Occult Body working for the regeneration of mankind. Taking this idea for a theme, Alexander the Great — he of the pen, not by the sword —has built up a series of improbable though highly romantic novels about the personality of Cagliostro, entitled "The Memoirs of a Physician" and "The Dia­mond Necklace." Verily, verily, Dumas pere had an elastic imagination! After making his prophecy about the Bastille, Cagliostro departed for his old vantage-ground, the Continent. He was unable to impress the hard-headed, prac­tical English people with his claims to occult powers. The Freemasons repudi­ated him with scorn, and there is a rare old print, much valued by collectors, which depicts the unmasking of the famous magician at one of the London lodges. The police authorities of the various countries had by this time become fully cognizant of Cagliostro's impostures. He was forbidden to practice his peculiar system of medicine and Masonry in Austria, Germany, Russia and Spain. Drawn like a needle to the loadstone rock, he went to Rome. This was in 1791. He was arrested by the Holy Inquisition and condemned to death as a sorcerer and Freemason, but Pope Pius VI commuted the punishment to life-imprisonment in the gloomy castle of San Leon, Urbino. Here in a subterraneous dungeon he fretted away his life in silence and darkness, until the year 1795, when he died. A French inspector of Italian prisons, who visited the fortress of San Leon, March 6, 1795, reported that he saw a sentence with au­tograph written by Cagliostro upon the dungeon wall. Cagliostro's wife died in a convent, sincerely repentant of her sins. Cagliostro's house in the Marais quarter, Paris, still stands — a memorial in stone of its former master. It is situated in the rue St. Claude at an angle of the boule­vard Beaumarchais. It was originally the property of the Marquis d'Orvilliers, and was selected and furnished by Cardinal de Rohan as a residence for the Grand Cophta. The somber old mansion has had a peculiar history. Cagliostro vacated it on the 13th of June, 1788, on the occasion of his exile from France. All during the great Revolution the house remained closed and intact. Eighteen years of undisturbed repose passed away. The dust settled thick upon the labora­tories, upon the séance-rooms and salons; spiders built their webs upon the gilded ceilings. Finally, in the Napoleonic year, 1805, the doors of the mansion were un­fastened, and the furniture and rare curios belonging to the dead conjurer were auc­tioned off. An idle crowd of quid-nuns gathered to witness the sale of the retorts, crucibles, elixirs, et cetera; to pry about, and speculate upon the secret staircases that ran through the walls of the building. In 1855 there were some repairs made. The great salons were cut up into smaller apartments. People pass and re-pass this ghost-house every day but not one in a hundred knows that the great enchanter once resided there, and held high court. Like a huge sphinx, it slumbers in the sunlight of the nineteenth century, blissfully un­conscious of the bus­tling world about it, and dreams old-world dreams of love and beauty, of magic and mystery. If those dumb walls could but speak, what fascinat­ing stories of super­stition and folly they might unfold to our wondering ears! Yes, in this ancient house, dating back to pre-Revolutionary Paris, to the old regime, the great necromancer known as Cagliostro lived, in the zenith of his fame, powerful as a noble, admired, nay, worshiped by princely dupes. In these golden years of his life, was he never haunted by dis­turbing visions of the dungeons of the Holy Inquisition, yawning to receive him? Ah, who can tell! Thanks to the gossipy memoir-writers of the period, I am able to give a pen-portrait, composite if you will, of some of the scenes that were enacted in the antiquated mansion. It is night. The lanterns swung in the streets of old Paris glimmer fitfully. Silence broods over the city with shadowy wings. No sound is heard save the clank of the patrol on its rounds. The rue St. Claude, however, is all bustle and con­fusion. A grand "soiree magique" is being held at the house of Monsieur le Comte de Cagliostro. Heavy old fashioned carriages stand in front of the door, with coach­men lolling sleepily on the boxes, and linkboys playing rude games with each other in the kennel. A rumble in the street — ha, there, lackeys! Out of the way! Here comes the coach of my Lord Cardinal, Prince Louis de Rohan. There is a flash of torches. Servants in gorgeous liveries of red and gold, with powdered wigs, open the door of the vehicle, and let down the steps with a crash. Mon­seigneur le Cardinal, celebrant of the mass in the royal palace at Versailles, man of pleasure and alche­mist, descends. He is enveloped in a dark cloak, as if to court disguise, but it is only a polite pretense. He enters the man­sion of his bosom friend, Cagliostro the magician. Within, all is a blaze of light. A life-size bust of the divine Cagliostro or­naments the foyer. Visitors are received in a handsomely fur­nished apartment on the second floor. Beyond that is the seance-room, a mys­terious chamber hung with somber drapery. Wax candles in tall sil­ver sconces, arranged about the place in mystic pentagons and triangles, illuminate the place. In the center of the room is a table with a black cloth, on which are embroidered in red the symbols of the highest degree of the Rosicrucians. Upon this strange shekinah is placed the cabalistic apparatus of the necromancer — odd little Egyptian figures of Isis, Osiris, vials of lustral waters, and a large globe full of clarified water. It is all very uncanny. Presently the guests are seated in a circle about the altar, and form a magnetic chain. As the old chroni­clers phrase it, to them enters Cagliostro, the Grand Cophta, the man who has lived thou­sands of years, habited in gorgeous robes like the arch-hierophant of an ancient Egyptian temple. The clairvoyant is now brought in, a child of angelic purity, who was born under a certain constellation, of delicate nerves, great sensitiveness, and, withal, blue eyes. She is bidden to kneel before the globe, and relate what she sees therein. Cagliostro makes passes over her, and commands the genii to enter the water. The very soul of the seeress is penetrated with the magnetic aura emanating from the magician. She becomes convulsed, grinds her teeth, and declares that she sees events taking place that very moment at Vienna, St. Petersburg, Rome and Kamschatka. Every one present is transported with joy. Monseigneur le Cardinal de Rohan is charmed, delighted, and lauds the necro­mancer to the skies. How weird and won­derful! Albertus Magnus, Nostradamus and Apollonius of Tyana are not to be compared with the all-powerful Cagliostro. Truly he is the descendant of the Egyptian thaumaturgists. The seance is followed by a banquet. Rose-leaves are showered over the guests from the gilded ceiling, perfumed water plashes in fountains, and a hidden orchestra of violins, flutes and harps plays soft melodies. The scene reminds one of the splendid feasts of the Roman voluptuaries in the decadent days of the empire. The lovely Lorenza Feliciani, wife, of tie enchanter, discourses learnedly of sylphs, salamanders and gnomes, in the jargon of the Rosicrucians. The Cardinal, his veins on fire with love and champagne, gazes amorously at her. But he is think­ing all the while of the aristocratic Marie Antoinette, who treats him with such cruel disdain. But Cagliostro has promised to win the Queen for him, to melt her icy heart with love-philters and magical talis­mans. Let him but possess his soul in patience a little while. All will be well. Aye, indeed, well enough to land the haughty prelate in the Bastille, and start the magician on that downward path to the Inquisition at Rome. The night wanes. The lights of the ban­queting-hall burn lower and lower. Finally the grandes dames and the seigneurs take their departure. When the last carriage has rolled away into the darkness, Cagl­iostro and his wife yawn wearily, and retire to their respective sleeping-apart­ments. The augurs of Rome, says a Latin poet, could not look at each other without laughing. Cagliostro and Lorenza in bidding each other good-night exchange smiles of incalculable cunning. The sphinx masks have dropped from their faces, and they know each other to be — charlatans and impostors, preying upon a superstitious society. The magician is alone. He places his wax light upon an escritoire, and throws himself into an arm­chair before the great fireplace, carved and gilded with many a grotesque image. The flames of the blazing logs weave all sorts of fantastic forms on floor and ceiling. The wind without howls in the chimney like a lost spirit. The figures embroidered on the tapestry assume monstrous shapes of evil portent — alguazils, cowled Inquisi­tors, and jailers with rusty keys and chains. But the magician sees nothing of it all, hears not the warning cry of the wind: he is thinking of his newly hatched lodges of Egyptian Occultism, and the golden louis d'or to be conjured out of the strong­boxes of his Parisian dupes. Originally published in Cosmopolitan Magazine. October 1899.